November is the month of Holy Souls in Purgatory, those faithful Christians who have died and gone before us but who still must atone for their sins. The time they spend in Purgatory cleanses them so that they may enter Heaven free from all effects of sin. Praying for the dead, especially for those we have known, is a requirement of Christian charity. Our own prayers and sacrifices can be offered up to relieve their suffering. How long will a soul stay in Purgatory? Purgatory is not eternal. Its duration varies according to the sentence pronounced at each particular judgment. It may be prolonged for centuries in the case of the more guilty souls, or of those who, being excluded from the Catholic communion, are deprived of the suffrages of the Church, although by the divine mercy they have escaped hell. But the end of the world, which will be also the end of time, will close for ever the place of temporary expiation. God will know how to reconcile His justice and His goodness in the purification of the last members of the human race, and to supply by the intensity of the expiatory suffering what may be wanting in duration. But, whereas a favourable sentence at the particular judgment admits of eternal beatitude being suspended and postponed, and leaves the bodies of the elect to the same fate as those of the reprobate; at the universal judgment, every sentence, whether for heaven or for hell, will be absolute, and will be executed immediately and completely. How can we help the souls in Purgatory? Having entered into the night “wherein no man can work,” the Suffering Church cannot ripen to its final blessedness by any efforts of its own, but only through the help of others—through the intercessory prayers and sacrifices (suffragia) of those living members of the Body of Christ who being still in this world are able in the grace of Christ to perform expiatory works. The Church has from the earliest times faithfully guarded the words of Scripture that it is a holy and a wholesome thing to pray for the dead that they may be loosed from their sins. [2 Macab. 12, 43] The suppliant cry of her liturgy: “Eternal rest give to them, O Lord, and let perpetual light shine upon them,” can be heard already in the Acts of the martyrdom of SS. Perpetua and Felicitas (A.D. 203) and is represented in numerous sepulchral inscriptions of the most ancient period, while theologians and Fathers of the Church, beginning with Tertullian, have supplied its substantial proof. The Catholic is jealous to expiate and suffer for the “poor souls,” especially by offering the Eucharistic Sacrifice, wherein Christ’s infinite expiation on the Cross is sacramentally represented, and stimulating and joining itself with the expiatory works of the faithful, passes to the Church Suffering according to the measure determined by God’s wisdom and mercy. A partial indulgence, applicable only to the souls in purgatory, can be obtained when the Eternal Rest (Requiem aeternam) is prayed. This is a good prayer to recite especially during the month of November: Eternal rest grant to them, O Lord, and let perpetual light shine upon them. May the souls of the faithful departed, through the mercy of God, rest in peace. Amen. Want to know more about Purgatory? Are You Ready For The Heavenly Banquet? We must always be ready to receive a precious call from our Lord. Many are called, but few are chosen” (Mt.22:14). In order to prove this statement Jesus presented a unique picture of a king who set a wedding banquet in honor of his son for his people (Mt.22:1-14). He took greatest care of the invited; at first he invited them, then he sent servants to call those who were invited. Again, he sent other servants to tell those who were invited that his dinner was ready. But they made light of it, and went off to their business. When the king saw that those invited were not worthy, he sent his servants to main streets with a fresh invitation for all, good and bad alike. And behold the wedding hall was filled with guests. The king was very happy to see that the wedding hall was filled and it came to his notice that a man was there without wedding garment. The king was surprised to see him and asked politely, “Friend, how did you get in here without a wedding garment?” But the man said nothing, neither did he apologize. So the king asked the attendants, to cast him out of the marriage hall in to the outer darkness. Jesus presents before us his Father who sets a Heavenly Banquet for which we are called and chosen. There are two categories of people mentioned here in the parable. The former is the category of people who are called or invited but they could not be present for the banquet. They took light of the call and went away to their own business, made them incapable of enjoying the banquet. The latter accepted the invitation wholeheartedly, put away the entire inconveniences, expressed honor and respect to the host. As a result they were chosen to enjoy the company of the host and the wedding banquet. The kingdom of God or the life to which we are called is like a wedding celebration for eternity. Usually the joy of a wedding feast ends within a week but the joy of a life to which we are called is for eternity. Unlike our style of invitation, we find God the Father – the host of the banquet takes greatest care and attention towards the invited. At first he invites them, secondly he sends his servants to call them, and again he sends other servants to tell them that the dinner is ready. It is inspiring to note that the servants did not go to invite the people, it is said, “They went to call the invited guests”, which means the invitation, is given by the king himself. Yes, God invited us to his banquet when he called us to existence. Time and again he sends his attendants through Sacraments, Divine Words, persons who come into our lives and daily events to remind us and guide us on our way to the banquet hall. 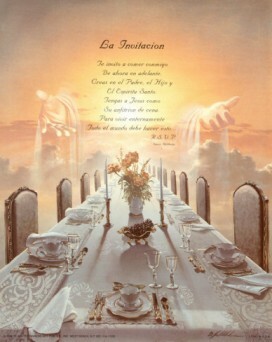 God the Father comes down each day with fresh invitation for everyone to his banquet. He makes no discrimination but calls the blind, the deaf, the dumb, the sinner, the sick and everyone is called to the wedding feast, provided they have the wedding garment. Wedding garment is provided freely to any one at the entrance of the wedding hall only they need to ask for, and put on the garment before entering the banquet hall. We are asked to put on the spotless white garment; we were given on the day of our Baptism as the symbol of purity. At this juncture the king at the banquet asks us, to put on that holy dress made available in the Sacrament of Reconciliation in case we have lost it through human weakness and sins. Just as we see in the parable the king will not entertain any excuse or justification if we fail to put on purity of soul through Sacrament of reconciliation which is freely and generously dispensed by the Church. God gives ample opportunities to regain the purity of soul or the wedding garment. Whoever postpones the Sacraments especially the Sacrament of reconciliation is keeping away the wedding garment and makes him or herself unworthy of enjoying the Heavenly Banquet. It is pity that the man without wedding garment did not answer to the king, he was silent. He could have made use of the last chance and pleaded for mercy and the merciful Father would have ordered his attendants to bless him with a fresh wedding garment. He failed to apologize even at the last moment and God would not let him enjoy the banquet. Our call to present state of life is a call to participation in the wedding celebration, no matter if one leads married life, Priestly life or religious life. All are called and chosen to foretaste the heavenly banquet here on earth, provided we have the wedding garment with us. I’m sure, if we put on a spotless wedding garment, possess a stainless soul and cultivate noble virtues we are certain of the foretaste of the heavenly banquet here and now. Many are called but few are chosen. We are certain of our call to the banquet, but are we chosen to enjoy the meal? It is good to introspect if I am with the wedding garment or not. Do I take care to maintain the purity of my soul, body and mind and be ready with the wedding garment? Prayer: Heavenly Father we thank you for having invited us to the wedding feast of your Son. Grant us your grace also that we may be counted among the chosen ones to enjoy the heavenly banquet. Forgive us Father for having lost the wedding garment on our way to the wedding hall. Lord God, have mercy on our human weakness and failures and bless us once again with a pure soul that we may be found worthy of entering the wedding hall. Heavenly Father bless us with your holy spirit that we may be sensitive to sin and keep our souls away from sin and always be found dressed in wedding garments Amen. From a loved one way up high. As fragile as a rose. From someone special up above. To cheer you all day long.